Velezita: Do You Know The Secret? Do You Know The Secret? This is the best information you'll ever get. I thought it was pretty much the way life worked, and never realized it was supposed to be a secret. 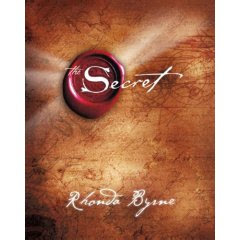 Rhonda Byrne fills us in on "The Secret". There's a book, a dvd, and a twenty minute online video you can watch - a preview of the dvd. You can watch the whole movie online for 4.95. If you want to buy the dvd after watching it, you can take the 4.95 you paid to watch it off the price of the dvd. Who could ask for a better deal? The Secret was also covered on an an Oprah show. It's in segments. This is the 1 of 5. This is not to be confused with the actual video. They are two different things. I just recently did a post on this as well, great video, very positive stuff, I have been trying to wake up with a the intention of having a good day since watching it. so far so good LOL. Prime Real Estate in The Caracas Area? What Is Your iPod Wearing? 4D - Best Ice Cream Ever!